Giuseppe Conte addresses the media after a meeting Wednesday with Italian President Sergio Mattarella at the presidential palace in Rome. Mattarella approved the lawyer's nomination to serve as prime minister. 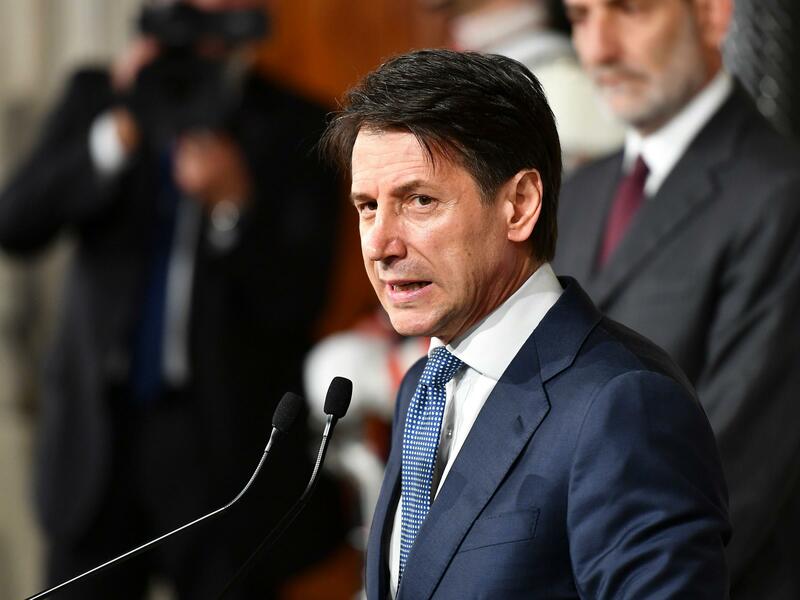 It took Italy's leading parties nearly three months of turbulent negotiations to hammer out a governing arrangement, but they've finally done it. The 5-Star Movement and the League — two populist parties that have agreed on little aside from their shared hostility toward the domestic political establishment, illegal migration and the European Union — finally settled on an unconventional pick for prime minister: lawyer Giuseppe Conte, a political novice with no government experience. Italy's center-left president, Sergio Mattarella, formally approved Conte's nomination for premier Wednesday after a few days of deliberation, giving him the mandate to form a government. Conte and the ministers he selects still require a vote of confidence in parliament, though the new government is expected to approve. The move ends the uncertainty that had simmered for weeks in Italy's upper echelons of power, since the 5-Star Movement, a Web-based protest party, and the far-right League emerged as the principal winners of March's parliamentary elections. At the time, as NPR's Sylvia Poggioli noted, local media declared that the results made Italy "ungovernable," and that prophecy appeared close to fulfillment earlier this month. Now that Conte has assumed the mantle of prime minister-designate and begun the complicated task of completing his cabinet, the question of who will lead has been answered — but many other pressing puzzles remain. Among them is a simple question: Who, exactly, is Conte? The 53-year-old law professor has no official political affiliation, has no government position and has even faced doubts around details on his resume. He was such an obscure choice for premier, in fact, that Agence France-Presse reports that his news conference Wednesday marked "the first time many had heard Conte's voice." "I'm preparing now to defend the interests of all Italians in all places, in Europe and internationally," he told journalists after his two-hour meeting with Mattarella, according to Reuters. "I will be the defense lawyer for the Italian people." Conte has quite a task ahead of him, both at home and abroad. Both parties at the heart of his coalition found success at the polls — riding a wave of popular dissatisfaction with the status quo, aiming their barbs at the EU and at the hundreds of thousands of migrants who have arrived in Italy over the past four years. Poggioli reported that the League's Matteo Salvini, for one, made a campaign promise to deport all undocumented migrants. But beyond those leanings, agreements have been hard to come by since the election — so hard, in fact, that the parties have reportedly proposed a "conciliation committee" to try to settle disputes within the coalition. Their program, forged from long and, at times, strained negotiations, also includes a mixture of lower taxes and higher spending that has unnerved some European economists wary of ballooning debt. But the skepticism goes both ways, as the fledgling coalition has vaguely promised to assert Italy's sovereignty and review its agreements with the EU. Some European officials, such as Pierre Moscovici, the European commissioner for economic and financial affairs, have expressed hope that common ground can still be found. "The fact that Giuseppe Conte spoke in favor of a dialogue with the European institutions is a step in the right direction," he said.